If you haven’t grilled chicken wings before, you absolutely need to start. 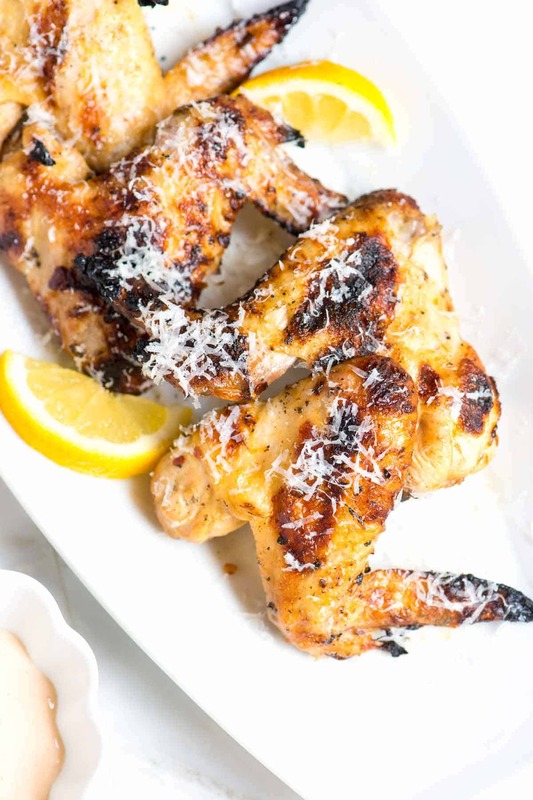 To get you moving towards wing happiness, these parmesan dusted, lemon garlic chicken wings are here to help. 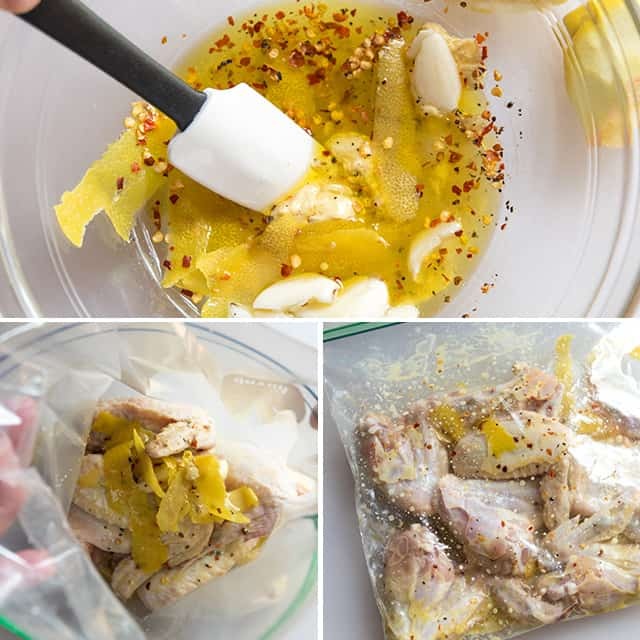 Jump to the Lemon Garlic Grilled Chicken Wings Recipe or read on to see our tips for making them. We marinate wings in what can only be described as one of the best chicken marinades, ever. Then they are grilled over low heat until the fat from the skin has rendered. They’re finished over high heat until the skin browns and chars just slightly. They are seriously good. Grilling chicken wings at home is easy. 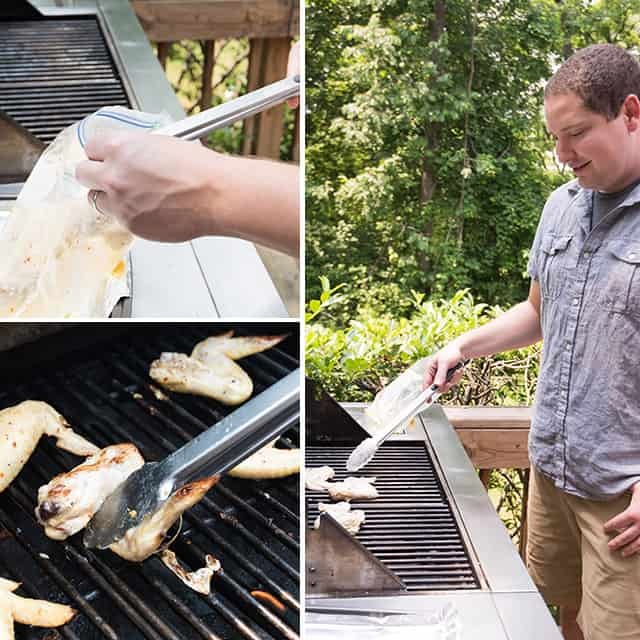 In fact, we’re thinking that once you try them, you’ll be hooked (like us) and might just find that this grilled wings recipe will be one of your go-to recipes this summer. Love Wings? 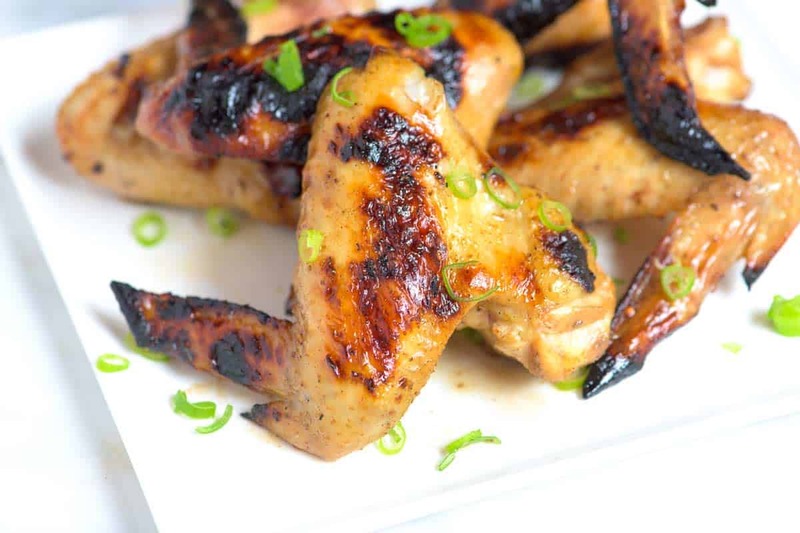 Take a look at more of our Chicken Wings Recipe ideas. This is the time to break out your favorite marinade (or use ours). When we were dreaming up this lemony grilled chicken recipe, we went straight to one of our absolute favorite marinades. It’s got a ton of lemon, mustard and garlic — making it perfect for wings. We marinate the wings for at least 1 hour, but longer wouldn’t hurt. You could even marinate overnight if you wanted to. By the way, we don’t bother to separate the drumstick from the “wingette” (or middle portion). If you are up to it, here’s a little tutorial with a quick video that we put together a while back showing you how to separate a chicken wing. Wings are perfect on the grill since grilling takes full advantage of the high ratio of skin to meat. Start with low or indirect heat and place them skin-side up. Close the lid and leave them for 10 to 15 minutes. Now that the skin and fat have rendered, grill the wings over high heat, turning occasionally, until golden brown and just slightly charred. We like serving our wings generously dusted in parmesan cheese, because why wouldn’t you? A simple dipping sauce made from mayonnaise, a little mustard, lemon and hot sauce is nice, too. 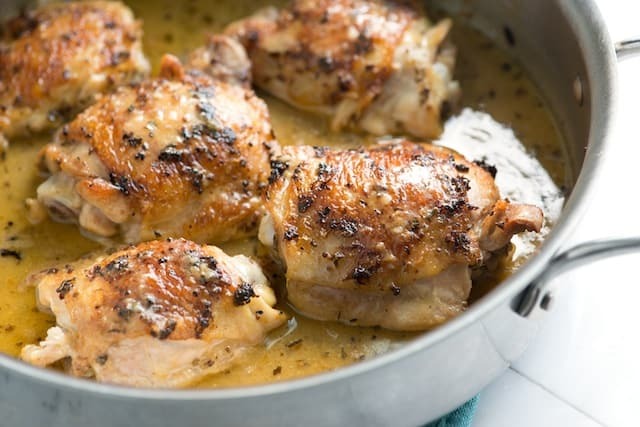 By the way, this recipe works beautifully with chicken thighs and chicken breast so be sure to print it, pin it or save it however you like. 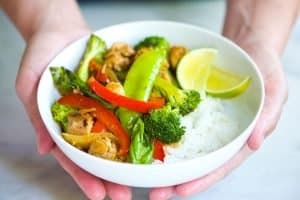 YOU MAY ALSO LIKE: Our popular recipe for Lemon Chicken. We start with chicken thighs, add lots of flavor then cook them until the skin is crispy and the meat is tender. These lemon garlic wings are a must-try. By first grilling the wings over low, indirect heat the skin and fat render. Then, we move the wings to a hotter, more direct heat until they become golden brown and slightly charred. Combine garlic, lemon zest, lemon juice, mustard, olive oil, salt, red pepper flakes and black pepper in a large resealable plastic bag. Add chicken wings, seal bag, and turn to coat. Chill at least 1 hour or overnight. Prepare grill for indirect heat. Remove wings from marinade and place, skin-side-up on grill. Cover grill and cook until fat has rendered and an instant-read thermometer reads close to 165º F, about 10 minutes. Move the wings over direct heat. Grill, turning occasionally, until wings are golden brown and slightly charred, 5 to 10 minutes. Stay close to watch for the occasional flare up. If this happens, move the wings to a slightly cooler part of the grill. Make dipping sauce by combining mayonnaise, mustard, lemon juice and hot sauce in a small bowl; season to taste with salt and pepper. 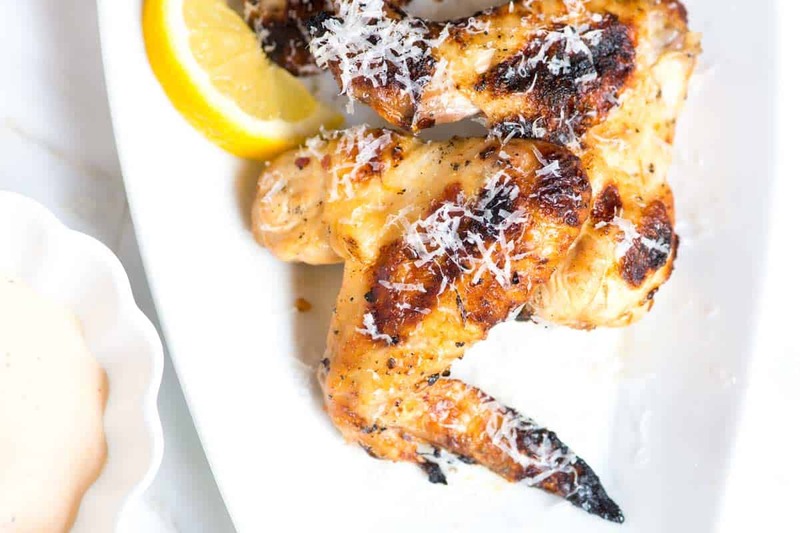 Dust the grilled wings with grated cheese and serve alongside dipping sauce. How to Set Up Your Grill for Wings: We like to use both indirect and direct heat to grill wings.For a gas grill, preheat the grill with all burners on high. Turn one side off or to low – this will be the side you start your wings. After the fat has rendered, move the wings to the side with burner still on. For a charcoal grill: Bank most of the coals on one side of the grill. The side with little to no coals will be the side you start your wings. After the fat has rendered, move the wings to the side with more coals. Hi James, So sorry you didn’t enjoy the wings. We love this marinade and use it often with poultry. The mustard and lemon should have flavored the wings. I’m glad you found an alternative. Love your recipes for chicken wings. Will try Sweet Chili, Brown Sugar, and Hot Wings recipes this week (my man loves his chicken wings). 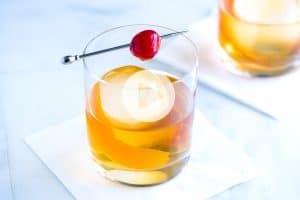 I can tell by the ingredients and your method that they will be tasty. Thanks so much for taking the time to go in detail on these recipes. You two are the best! Hi!!! 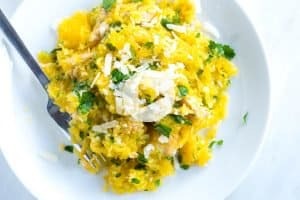 Absolutely love your recipes. Unfortunately, I don’t have Dijon mustard on hand..can I substitute with something else or just leave it out? You can leave it out. Whole grain mustard is nice, too.